Normally, an upside-down fish in your tank is bad news. As in, it’s time for a new goldfish. That’s because most fish have an internal air sac called a swim bladder that allows them to control their buoyancy and orientation. They fill the bladder with air when they want to rise, and deflate it when they want to sink. Fish without swim bladders, like sharks, have to swim constantly to keep from dropping to the bottom. If an aquarium fish is listing to one side or flops over on its back, it often means it has swim bladder disease, a potentially life-threatening condition usually brought on by parasites, overfeeding or high nitrate levels in the water. But for a few remarkable fish, being upside down means everything is great. In fact, seven species of catfish native to Central Africa live most of their lives upended. These topsy-turvy swimmers are anatomically identical to their right-side-up cousins, despite having such an unusual orientation. People’s fascination with the odd alignment of these fish goes back centuries. Upside-down catfish have been carved into Egyptian tomb walls dating back 4,000 years. Today, they’re more often found in aquariums, where they can live up to 15 years and grow to be 4 inches long. Studies of these quizzical fish have found a number of reasons why swimming upside down makes a lot of sense — and there’s even a climate change angle. Robert Blake, a biology professor at the University of British Columbia, showed that, for fish, it’s just as efficient to swim upside down as it is to swim right side up. Blake, who died in 2016, found “no significant difference” in the two postures, as long as the fish was far enough below the waterline. But the picture changes near the surface. Whether you’re a fish or an Olympic swimmer, that’s when “wave drag” comes into play. Wave drag is the turbulence produced by friction — basically, splashing — which makes it harder to swim. In an upside-down position, fish produce a lot less wave drag, according to Blake’s research. 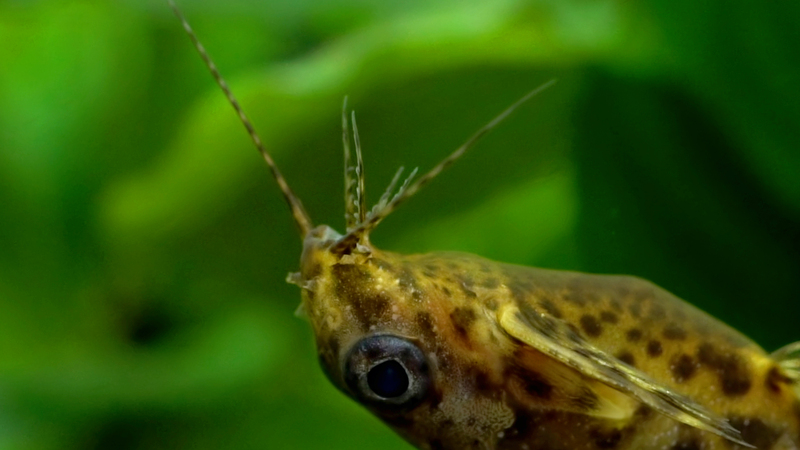 That means upside-down catfish do a better job feeding on insect larvae at the waterline than their right-side-up counterparts, which have to return to deeper water to rest. There’s something else at the surface that’s even more important to a fish’s survival than food: oxygen. 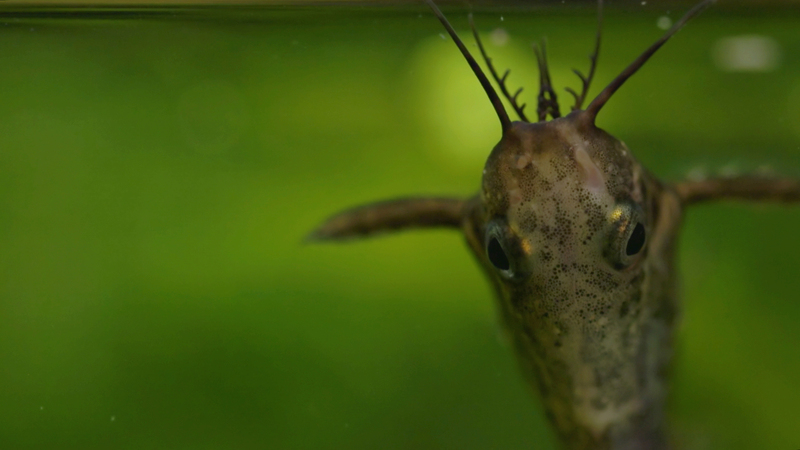 The gas essential to life readily dissolves from the air into the water, where it becomes concentrated in a thin layer at the waterline — right where the upside-down catfish’s mouth and gills are perfectly positioned to get it. That ability can be critical for survival when the water becomes depleted of oxygen, a condition called hypoxia — which occurs naturally in some river systems, especially if they are marked by low light and dense vegetation, as in swamps. 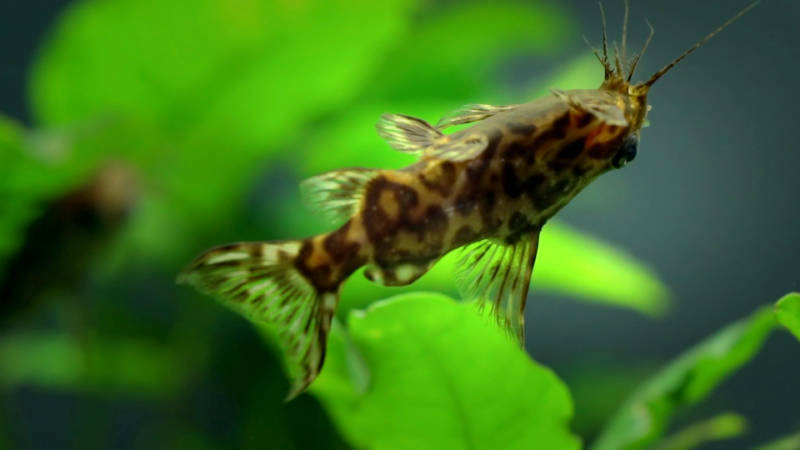 “The upside-down catfish seems to have a whole suite of adaptations that make life at the surface more tenable,” said Lauren Chapman, a biology professor at McGill University who has been studying for more than two decades how fish respond to hypoxia in African river systems. In one experiment, Chapman compared how upside-down and right-side-up catfish performed under low-oxygen conditions in a laboratory. She found that their swimming positions allowed the upside-down fish to breathe at the surface more easily, while the right-side-up ones had to work harder for the same benefit. Upside-down swimming didn’t necessarily evolve in response to hypoxia, Chapman said. But for many fish in the wild, oxygen levels in the water can have a big impact, including increased gill size and smaller egg numbers, which eventually could lead to the formation of separate species. When human activity, such as industrial pollution or farm runoff, causes hypoxia, the results are more catastrophic. The contamination feeds algal blooms and ultimately bacteria that consume the water’s oxygen. In places as far-flung as the Gulf of Mexico and Africa’s Lake Victoria, human-caused hypoxia has led to large-scale die-offs of marine life, called dead zones. Climate change has brought the issue of hypoxia further into focus, in part because warmer water holds less dissolved oxygen. For many fish species, it could be a case of adapt quickly or perish. Scientists estimate that upside-down catfish have been working out their own survival strategy for as long at 35 million years. Besides their breathing and feeding behavior, the blotched upside-down catfish from the Congo Basin has also evolved a dark patch on its underside to make it harder to see against dark water. That coloration is remarkable because it’s the opposite of most sea creatures, which tend to be darker on top and lighter on the bottom, a common adaptation called countershading that offsets the effects of sunlight. The blotched upside-down catfish’s reverse countershading has earned it the scientific name nigriventris, which means black-bellied. But scientists have been unable to pinpoint much in the catfish’s anatomy to explain why it swims the way it does. Researchers at Nara Medical University School of Medicine in Japan, led by Ken Ohnishi, even looked at the fish’s inner ear, site of the bones that control orientation in vertebrates, and found nothing unusual. While these unusual catfish sometimes turn right side up to feed, they soon return to their preferred position. So the mystery of the upside-down catfish persists, for now, as a puzzle for future scientists. "These catfish have always been interesting to people who are looking for things that are out of the ordinary,” said Friel.